Las Vegas itself is an adventure, and what better way to enhance your Las Vegas vacation then to join us on this historic tour. Dean Outdoor's small-group personally guided tour is designed to maximise your time! The Hoover Dam Expedition tour combines the best that the dam has to offer and your personal guide will ensure that you will not only have fun but learn about Nevada's diverse history. This small-group Hoover Dam Expedition Tour is a tour that takes you back in time to one of the man-made Wonders of the Modern World. Leaving Las Vegas behind, you will travel through the historic government built town of Boulder City (created for the workers of the dam) and on to the Lake Mead National Recreation Area, home to the largest man-made body of water in the Western Hemisphere. In Boulder City we will enjoy a hearty sit-down breakfast at a local diner (included in tour price). After breakfast, continue onto Hoover Dam, making two scenic stops along the way. Arriving at Hoover Dam you will be guided through the visitors centre by one of the Bureau of Reclamation government guides. 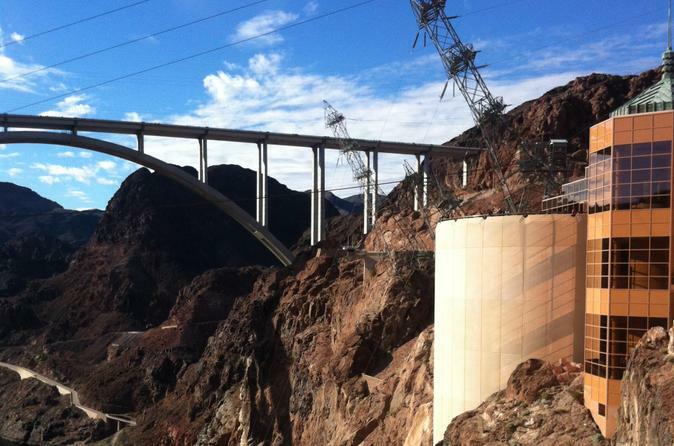 Here, you can view exhibits from the period and discover the history of Hoover Dam. Take a seat and enjoy a 10 minute movie presentation on the construction of what was originally known as "Boulder" Dam. Then it's off to view the giant generators on the Bureau of Reclamation Power Plant Tour where you will travel down over 500 feet and maybe have water drip on your head! NO It's not leaking - it's called seeping and is a natural occurrence of all rocks near rivers. As you arrive at the base of Hoover Dam you will be able to marvel at the generators within the power station. They must be seen to be believed!